SF1530 is a high performance, low cost, highly integrated current mode PWM controller for offline flyback converter applications. PWM switching frequency with shuffling is externally programmable, which can reduce conduction EMI emission of a power supply. When the output power demands decrease, the IC automatically decreases switching frequency for high power conversion efficiency. When the current set-point falls below a given value, e.g. the output power demand diminishes, the IC enters into burst mode and provides excellent efficiency without audio noise. The IC can achieve “Zero OCP/OPP Recovery Gap” using SiFirst’s proprietary control algorithm. Meanwhile, the OCP/OPP variation versus universal line input is compensated. 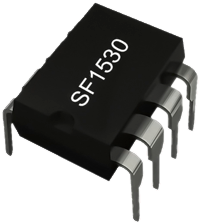 SF1530 integrates functions and protections of Under Voltage Lockout (UVLO), VCC Over Voltage Protection (OVP), Cycle-by-cycle Current Limiting (OCP), All Pins Floating Protection, Over Load Protection (OLP), RT Pin Short-to-GND Protection, Gate Clamping, VCC Clamping, Leading Edge Blanking (LEB). SF1530 is available in SOT23-6, DIP-8 packages.